I would like to use statistical accounts to process some internal allocations to various projects within our system, as I do not want them to impact the financial reporting. That being said, I've set up a STAT ledger and a BUDGET-STAT ledger. I know the process for setting up a new account, but how do you set up a statistical account? Is it the same? How is this "flagged" as statistical? Also - how do you do a journal entry to a STAT account? I think I understand how to pull the data into reporting, but outside of that, I'm struggling. You don't need to create "statistical accounts;" you can use any accounts with any ledger. I recommend using existing accounts/subaccounts with statistical ledgers. I like to use the same accounts/subaccounts for the statistical numbers that you will use them with on the financial reports. E.g., if you want to show revenue per employee (or customer served, etc. ), use the revenue accounts/subaccounts that have the balances that will be prorated by the statistic. XLstatements has a Budget option that lets one maintain statistical (and budget) ledgers within Excel and updates Dynamics SL with one click. 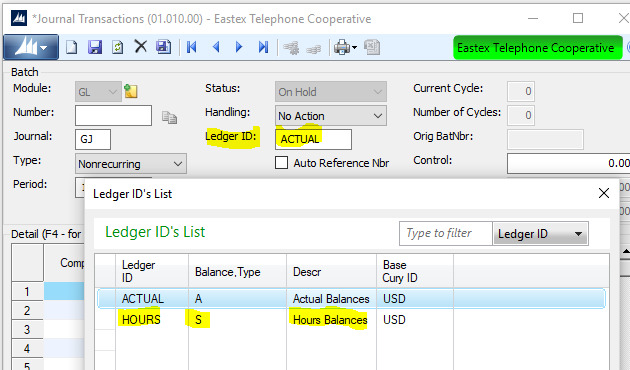 To change to a STAT ledger in a JE, just change the ledger ID to whichever ledger you would like....you can use the exact same account/subaccounts. For reporting like in MR, you will just change the ledger as well to pull the correct numbers. FYI - your trial balance will pull all ledgers when run. I have setup templates for us that prints only actual ledger and can print our statistical ledger (we enter hours for doing allocations). The process for setting up an account for use in the statistical ledger is the exact same as for any other ledger (such as budget or actuals). Any account you create can be used with any ledger you're running. You just want to ensure that in your entry screens, such as journal transactions, you select the appropriate ledger you would like to impact with the entry.